A 2010 FIFA World Cup Final Game-Used Match Ball from the Final between Spain & Netherlands on July 11, 2010 in Johannesburg, South Africa. Late 1970's New Orleans Jazz Pete Maravich Game Worn Jersey. 1996-97 Michael Jordan N.B.A. Finals Game Worn and Signed Jersey. 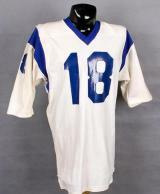 Early to Mid-1970's Willie Lanier Game Worn Jersey. While most football enthusiasts enjoy watching the nimble feet of a Barry Sanders or LaDainian Tomlinson, an equal number of purists would rather see the bulldozer style of John Riggins or Jim Brown.